Hello all. I am posting see if the community here can offer any insight into the most efficient way to complete my degree requirements. I have taken, and like, Straighterline courses, and I'm willing to try others as well if they're more efficient in a certain area. I have never done DANTES/CLEP/TECEP or any of the other exams however I am a great test taker if it helps. I was ready to knock this degree out a year ago when a lot of "life" happened. I plan to dig back into the threads here to see what's new. I'll definitely put in the research time as well, but I wanted to ask the pros. Maybe you will see something with the distribution, etc. I will be enrolling into a TECEP exam course for February in order to maintain my enrollment since I didn't end up finishing last year, fyi. Thank you all for any help/insights/confirmations you contribute. Anything highlighted in green is in need of completion, and notwithstanding ENC-102, COM-108, and Capstone, flexible. -ENC-102 - If you're taking a TECEP, take this one, it's going to be one of the easier ones ENC-102-TE. In order to get a discount, you should take two to four Study.com courses, see above to my recommendations. Take two History courses back to back, then take the Comm 120 with the Business 303. BTW, you have Principles of Management showing up twice, you just need one of those courses. 1) Prin of Management is listed in AOS and Free Electives - delete it from the AOS, it won't go there. Thank you for the assistance. Due to being -1 SH in Ethics and +2 SH in The Natural World I'm net +1 Semester Hour which leaves me a 19 Semester Hour requirement in General Education rather than the 20 Semester Hours my degree is programmed for. (01-09-2018, 11:34 PM)YXJeff Wrote: Thank you for the assistance. Due to being -1 SH in Ethics and +2 SH in The Natural World I'm net +1 Semester Hour which leaves me a 19 Semester Hour requirement in General Education rather than the 20 Semester Hours my degree is programmed for. I'll be there is NO ONE who has exactly 120 credits on their transcript, so honestly, it's not something you should worry about. Those 2 NFA courses come in as FIS-391 and HRM-331, and both will go in Free Electives. The TEEX course will come in as CAP-295, and is also a Free Elective. I would think about what's the quickest way to get those Gen Ed's, and I think Study.com, where there will be overlap, is your best bet. 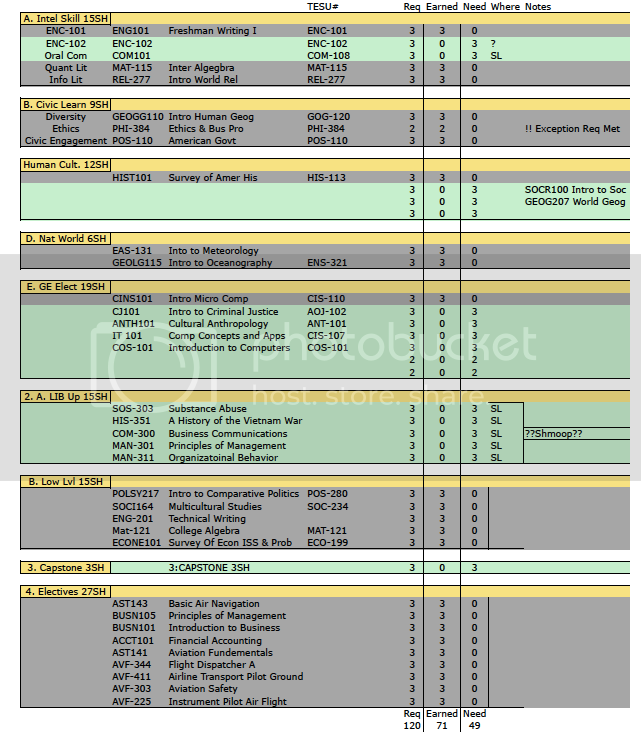 Both Civil War courses (which will also have overlap with US History which you're planning to take), both Vietnam courses, maybe all 3 computer courses (MIS, Info Sys, & Intro to Computing). Several Psych courses. Several math courses. Things like that. When you take 2+ courses that are similar, it really cuts down on the amount of time it takes to complete them using Study.com (for example as you go through US History, there will be sections on the Civil War, so when you log into the first Civil War course, it will already have those done, and you'll be some % completed with the course. Then after you finish that course, and you go to do the 2nd Civil War course, an even higher % will be completed because you'll have done the US History course AND the 1st Civil War course). Perhaps this is a silly question, but did you submit those on an ACE transcript or did you try to submit them directly? TESU only grants credit for them through ACE. Also, are you actually planning to take Intro to Psych at TESU? There are cheaper places to get that. I did submit those courses through an ACE transcript. I have a ton of electives and "other" courses that don't fit anywhere in the degree program. (01-10-2018, 09:11 AM)YXJeff Wrote: I did submit those courses through an ACE transcript. 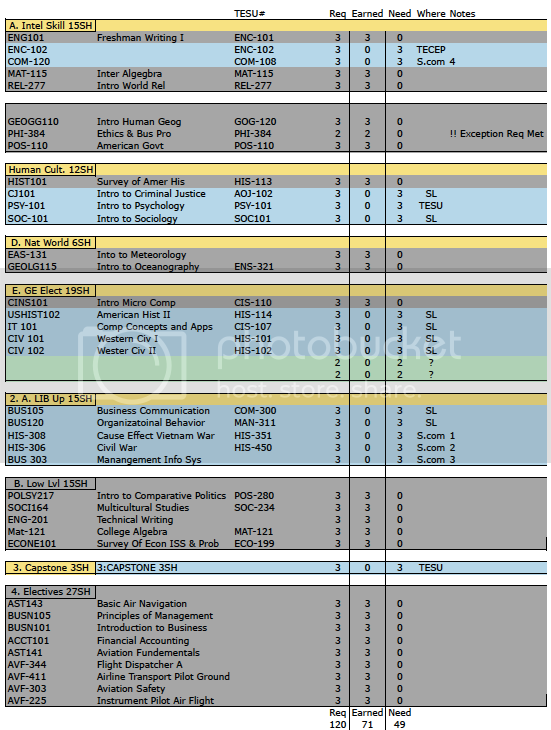 I have a ton of electives and "other" courses that don't fit anywhere in the degree program. Ok, the reason I asked is because I didn't see any course equivalencies, which even an entries in "Other Courses" should have. Did they assign equivalencies? I've signed up for the Feb term ENC-102 TECEP. I test well, but I also do well with structure so I'm looking forward to see how this TECEP goes. I'm going to dig into the TECEP .pdf and just start attacking the subject matter.